When you create a new well in Insight, the first step is to define the general well information. Subsequently, you can link the new well to its components that include the deviation, checkshots, markers and LAS files. At the tab header, click the Add icon and click New Well. The New Well window will be displayed. At Well Name, type a name for the new well. Select the type of well at Well Status and the related standard well symbol will be displayed in the Map View and 3D View. At Land/Marine select Marine if the well is an offshore well or Land if the well is an onshore well. Type the Kelly Bushing Height of the well. Kelly Bushing is the height of the Derek (drill rig) measured from the mean sea level (MSL) (see Height datums and abbreviations). If the well is a marine-type well, type the Water Depth. If the well is a land well, then type the Ground Level. Note: Ground Level is only used for below-mudline values such as in predict and lithofluid processes. It has no influence on the positioning of well data. 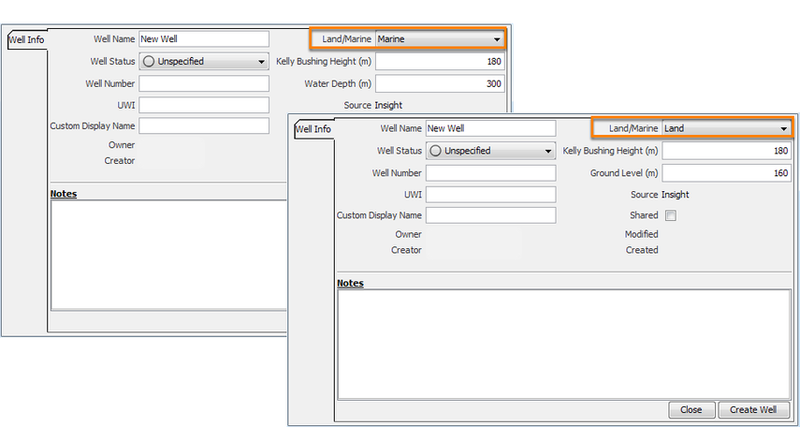 Insight also supports the creation of new wells by using the Unique Well Identifier (UWI) code. At UWI, type the 16-character code that defines the well. You can also designate a Well Number and Custom Display Name for your well. Select the Shared check box if you want to make the well visible to other users. If you have any additional information about the well, type it in Notes. Once you have entered the general well information, you can proceed to loading the component files for the well in the Path, T/D Pairs, Markers and Curves tabs.